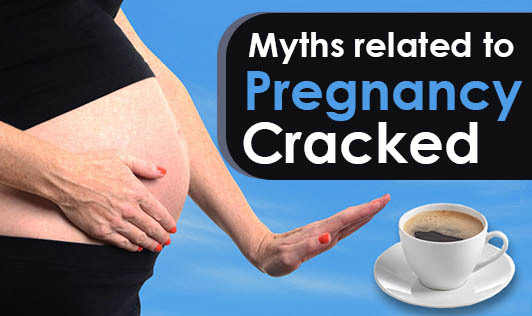 Myths related to Pregnancy Cracked!! 1. Pregnant women who carry higher, deliver a girl and who carry lower, deliver a boy. Fact: This is the most common myth one can hear. Carrying higher or lower does not depict the gender of the baby. It depends on the woman's muscle type, body structure and the position of the baby inside womb. 2. All pregnant women experience morning sickness. Fact: Morning sickness is caused due to secretion of the female hormone ‘estrogen'. The amount of estrogen secreted in every pregnant female differs, and so the frequency of morning sickness differs too. Hence, morning sickness varies in individuals. 3. If the pregnant lady holds her arms above the head level, the umbilical cord will be wrapped around the baby's neck. Fact: This is a misconception (which may have been created to keep pregnant women from doing any work). The umbilical cord might get wrapped around the baby's neck if the baby moves a lot in the womb. 4. A woman cannot get pregnant again while she is still breast feeding the baby. Fact: Many gynaecologists suggest using contraception after delivery, as the lactation period is not reliable after a certain period (i.e. one to one and a half months). A woman can get pregnant even without getting her first menstrual cycle after delivery. 5. A woman will have to go for a Caesarean section delivery, if her mother has had a C section too. Fact: The mode or method of delivery depends on a lot of things like, position of the baby inside the womb, mother's pelvic bone structure, complications (if any), etc. It cannot be hereditary!